Published on 21 November 2012. This Christmas will be the tenth for which Wendy and I have been together. For six of the past nine Christmases, I’ve made Wendy an advent calendar: I didn’t for our first two Christmases, and a couple of years ago – much to her disappointment – I just bought one from Hotel Chocolat. I’ve done all sorts over the years, from a hamper of small gifts, to small gifts hanging on the tree, to stuffed “mini stockings” (aka trainer socks), to customised crackers. Oddly, I’ve noticed that several of those ideas are available in commercial packages this year… perhaps that’s been going on for a while, and I just haven’t noticed. 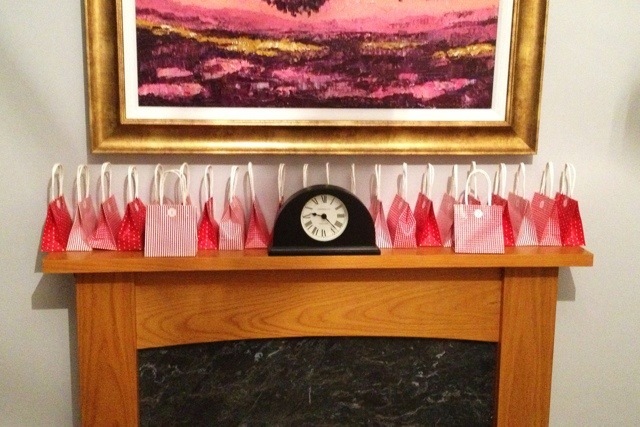 This year, I’ve prepared 24 mini gift-bags, all assembled on our mantelpiece. Frustratingly, 24 wouldn’t quite fit side-by-side, hence the two odd ones at the front… but I guess that problem will be solved by 2nd December anyway! I’d normally keep it all hidden until 30th November, but couldn’t find anywhere big enough to secrete it this year! And fear not – the rest of our decorations are most certainly not up yet! This 1,899th post was filed under: Photo-a-day 2012, Christmas.